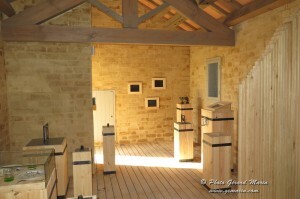 – Free for people who have paid a guided tour on the same day. For safety reasons, groups of children are not allowed on the Etourneau trails. 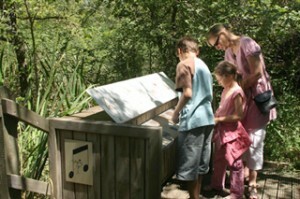 The Cabin’s trail, an entertaining and educational trail, 500m long on a boardwalk with eight interactive cabins. Discover all of Mother Nature’s secrets with your children. 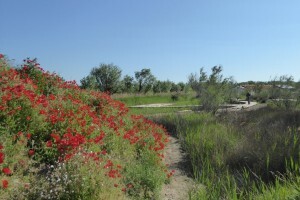 The ethno-botanical trail is a one hectare area dedicated to plants and habitats in the Camargue. 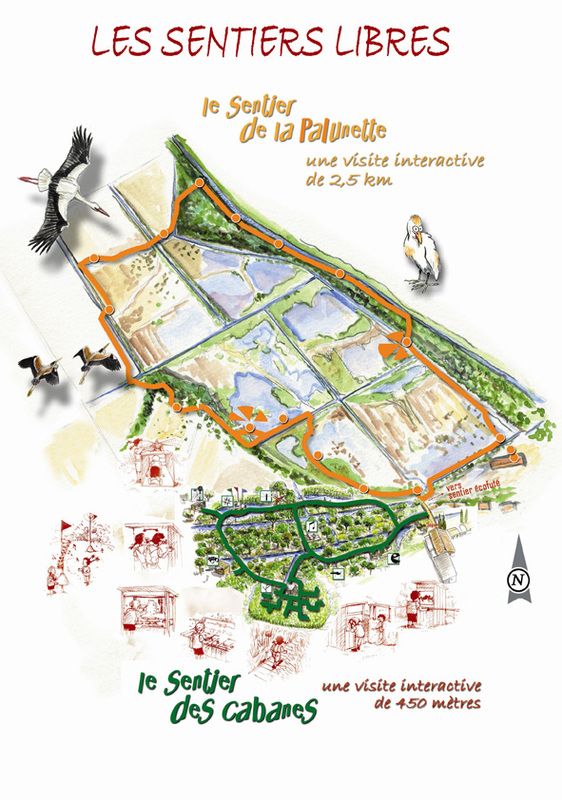 Following the path, you will go through five distincts habitats (a riparian forest, a salt marsh, a reedbed, a dune and a typical habitat called costière) where you can find plant from the Camargue and become familiar with them. You will also learn how they have been used by men. The sharp ecologist trail answers to an objective of awareness of environmental issues. It has been created with the European program Life PROMESSE which shows with different devices all the responsible and ecological actions which were set up with themes like water, energy and waste. Each devices is inspired by the nature to provide solutions humans can use. 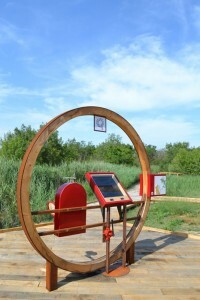 The trail is equipped with interactive games that illustrate the use of the dry toilets, natural sewage treatment station, the thermal solar panel, the rainwater collection tank. Visitors, you must be active and solicit your different senses (hearing, touch, sight) while playing with the elements of the trail to understand the natural mechanisms. And then, maybe you will want to reproduce these ecological and environmental solutions in your daily life. Each trails offers an interpretive booklet including a map of the site, information on the different themes during the visit and the rules of conduct to be adopted on a protected nature site. Available on site and on the online shop (€3). 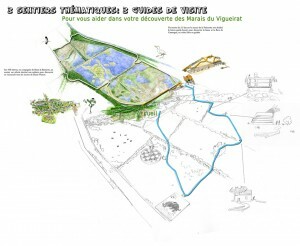 Additional trail of the exisiting Etourneau trails, the Man and Nature Trail aims to present the human activities that is compatible with a protected nature area and the use of space by wildlife. 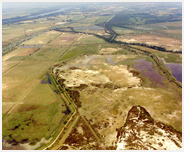 In other words, a comprehensive rural heritage in the Camargue around the following themes : agriculture, fisheries, rice livestock, contemporary art, ecology and eco-responsibility. This trail is meant to be « alive » by incorporating both social, civic and artistic aspects, where the presence of man in this protected nature area is highly desirable. Visitors will experience a real situation through direct observation or an evocation when they are absent through entertainment (audio, photo…). Dès à présent, vous pouvez découvrir lors de visites guidées ou de manifestations thématiques, certains équipements du futur sentier Homme et Nature, comme la Cabanataú, le pont à bulles ou encore la Maison des chauves-souris : réalisée dans le cadre du Life+ Chiromed, il s’agit d’un espace muséographique pour le grand public mais également gîte aménagé pour répondre aux besoins des colonies de reproduction du Grand Rhinolophe et du Murin à oreilles échancrées. From now on you can discover some of the facilities such as the Man and Nature trail, the Cabanataú, the bubble bridge or the House of bats: performed in the framework of the Life + Chiromed, It is a museographic space for the general public but also a shelter set up to meet the needs of breeding colonies of the greater horseshoe bat and Geoffroy’s bat.